I’ve known about the Golden Mean for a while now and lately the Fibonacci sequence which was an easier way to understand it. The Golden Ratio (Golden Mean, Golden Section, Golden Number) is essentially a proportion in which a straight line is divided into 2 unequal parts in a way that the ‘ratio of the smaller to the greater part is the same as the ratio of the greater part to the whole.’ OCA course material. 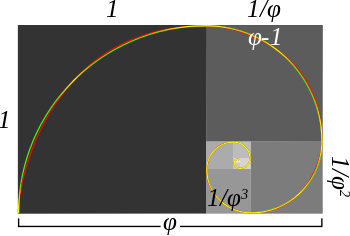 The ratio of the golden mean is 1 to 1.618. 0/1 – 1 – 2 – 3 – 5- 8 – 13 – 21 – 34 – 55 – 89 – 144……and so on, and so on. Here is a diagram depicting the Fibonacci spiral on top of a Golden Rectangle. The Fibonacci Spiral is commonly found in nature from the spirals seen in certain fruit to the spiral shape of galaxies and because of this it is also known as the divine ratio as some believe it is the finger print of the creator. In the Renaissance period the golden ratio was known as the Divine Proportion was used by artists such as Leonardo Divinci. ‘All the key dimensions of the room, the table and ornamental shields in Da Vinci’s “The Last Supper” were based on the Golden Ratio.’ www.goldennumber.net. Other Renaissance artists who used the Divine Proportion were Michelangelo in his painting of “The Creation of Adam” on the ceiling of the Sistine Chapel, Raphael in the ‘School of Athens’ and Botticelli in the ‘Birth of Jesus’. Coincidentally the canvas of ‘the Birth of Jesus’ was also of ‘Golden’ proportions. It is said that art based on the Golden rectangle is more attractive to the eye but it is not known why. All squares and rectangles but especially the those based on the Golden Rectangle contain areas inside where things become the most appealing. Those points are seen below and are called the eyes of the rectangle. Before starting the Drawing 1 Course I had never heard of the ‘Rule of Thirds’ but once I had I used it for a lot of still lifes and sketching outdoors. The rule of thirds is used to get a more balanced but natural looking composition. This is done by slitting the canvas or other support into thirds by way of a grid and then placing the objects of interest, maybe a farmhouse and fence or tree on a hill in the position where to lines cross. 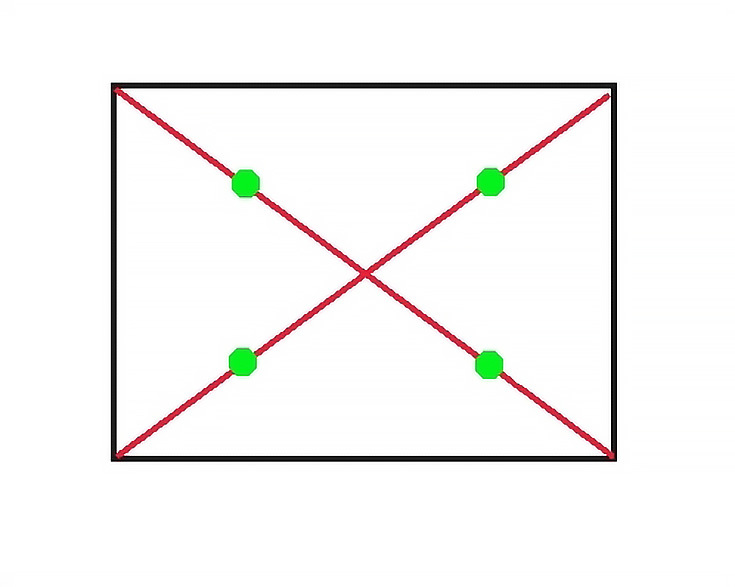 In the diagram below the rule of thirds is seen in blue vs a grid based on the Golden Ratio in red. George Seurat is thought to have used Golden Mean in at least a third of his paintings. In the painting above you can see how the sale and the far bank of the river sit against the lines of the grid constructed of Golden Proportions. 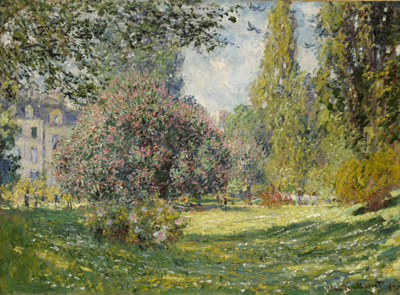 On the other hand when I look at paintings by Claude Monet it seems that he uses the rule of thirds in most of his landscapes here you can imagine the second tree from the right and the surface of the grass sitting on the grid lines. This entry was posted in 1- Research Point the Golden Mean, 5 Painting Ouside, Coursework, Pt 4 - Looking Out and tagged divine proportion, fibonacci sequence, golden proportions, golden ratio, golden rectangle, oca painting 1, painting outside, research point, the golden mean on April 19, 2016 by Mark A Smith.